This case has had a strange relationship with the press. The earliest articles are the ones that made an impression on the community, although they were full of inaccuracies and lies. The newspaper and stations did not deliberately print false information – they printed the story the police told. Over the years the coverage would change dramatically, with the same newspaper eventually printing a 7 part expose style series on the case. Since the beginning of this case there has been a tremendous emphasis on race as it pertained to the crime itself and its potential impact on motive. We have caught plenty of heat for not shying away from discussing that, but is worth mentioning that we didn’t bring that emphasis here we simply exposed the opposing vantage point on it. The first articles in this case and nearly every one written since identifies the races of those accused very specifically. It is an interesting element of the case and one to which Eugene and some supporters have spoken directly. Ethnicity and culture impacted this case from many angles. Although this is not the most pressing or urgent issue in this case, it is thought-provoking and deserves to be addressed. This post contains their well articulated thoughts on the topic. “There is a critical and misunderstood difference between ethnicity and culture. Kevin’s ethnicity and his cultural identity may be different. His perception of his place in a community or culture versus the perception of the community’s view of him may differ as well. As in, Kevin may not see himself as culturally Athabascan while the Koyukon Athabascan community may see him as a member. To Kevin specifically he grew up with Athabascans through a series of events which he did not control as a young person which is not much different than a birthright. We are born into cultural identity in the sense that we are born into a specific culture. For many and most people this may align with their ethnic makeup and for some it does not. 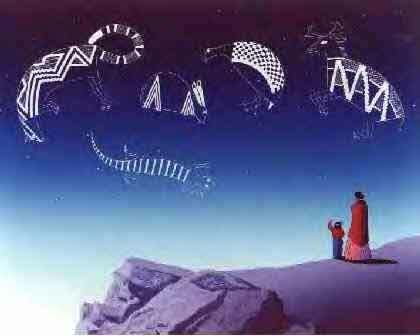 Through experience and sustained contact he was raised culturally Athabascan. Kevin does not look at a Native person and see a ‘Native.’ Kevin sees a person and often a person he knows through a relational concept of identity (again a concept which he was exposed to culturally). This is a tricky concept to articulate but I hope at least some blog readers can and will follow. Fundamentally, Kevin is a cultural Alaska Native. At least, that is my perception of Kevin and I know it is widely shared in the Interior Native culture of Fairbanks in particular. Kevin for example is far more culturally Athabascan than an ethnic Athabascan who was raised by Swiss Italian American parents in New Jersey and never exposed to our way of life. That person is ethnically Alaska Native and culturally not. Those adopted in are more culturally a part of a society than those adopted out. I want to find a way to make the frustration when it comes up over and over in newspapers that identify him as white or outside Indian understandable to any random reader. When, while that may be true from a genetic or ethnic perspective, it is dismissive to us as a culture to instruct who we can consider part of our people, and further dismissive of our individual value as just human beings. The emphasis on race in these publications does not have the goal of identification although that may be the stated goal or the only motivation consciously known to the author, the categorization on this level has to do with othering the subjects. The ‘othering’ of Kevin in the beginning of this case was important. The media and community were hung up on this notion of the players. They couldn’t make a sound case for the guilt of innocent men in a crime so they had to attack their essence as a way to attack their credibility based on the social psychological perception of the situation. They placed them into roles that met the social normative and were therefore more readily accepted. They made these human individuals into archetypes – Eugene the stupid savage, Marvin the savage nature, underscoring the notion that even cloaked in apparent assimilation (valedictorian, etc) there is a savage nature; a difference which is past skin deep, George as the wild savage, and Kevin was the disturbed race traitor who associated with them. Then there did not have to be actual motivation the public would accept the motivation was simply their nature, so different from the reader. In reality these identities were a construct which had almost nothing in common with who these people were as individuals and was only an articulation of racial archetypes. The exact nature of the statements made by Jason Wallace regarding his participation in the Hartman murder have long been veiled in secrecy and the source of much speculation. The statements of Wallace, as summarized by Judge Paul Lyle in a document that was intended to remain confidential, were briefly published by the Fairbanks Daily Newsminer. An article posted by the Fairbanks Daily Newsminer on August 20, 2015 to the newspaper’s website revealed the specifics of the confession, apparently made in 2003 to an attorney and investigator employed with the Fairbanks Public Defender’s Office. The Newsminer reported the details of Jason Wallace’s statements were leaked “inadvertently” by a party who was in lawful possession of the material. The article then goes on to detail the confession of Jason Wallace in the murder of John Hartman. Wallace confessed in 2003 while awaiting trial on an unrelated murder to public defender Geoffry Wildridge. Wildridge then sent public defender investigator Tom Boles to speak to Wallace, presumably to investigate the veracity of his claim. Wallace, like Holmes, describes leaving a party in a car with the intention to assault people. He describes first assaulting a man on First Avenue and robbing him. Holmes also describes an assault that preceded the Hartman beating, but in less detail. Wallace’s description of the assault closely matches the facts known about the Dayton assault, which figured predominantly into the case. 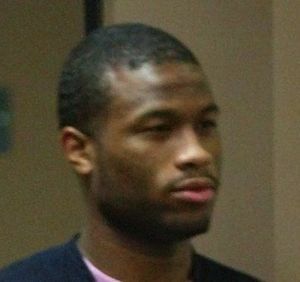 Wallace names three people as participants in the Hartman murder – himself, William Holmes, and a third person, whom the article only clarifies as a man also named in the 2011 Holmes confession. We feel it is safe to assume that Jason Wallace named himself, Holmes, and Rashan Brown, as both Brown and Holmes were both incarcerated in maximum security facilities in others states, had less to lose, and posed no threat to Wallace. Holmes names the same three participants as Wallace, plus Marquez Pennington and Shelmar Johnson. Wallace denies sexually assaulting Hartman, and states that he does not think his group would have sexually assaulted Hartman. He speculates that the Fairbanks Four could have found and sexually assaulted Hartman later. In reality, there has never been any forensic indication of sexual assault. The charges were based entirely upon the observations of one nurse, not qualified to take an exam, and whose belief Hartman was sexually assaulted contradicted the autopsy and medical examiner’s conclusion. Wallace claims he, not Holmes, was driving the car. Holmes and Wallace essentially finger the other as the major aggressor, although both confess to participating in the planned hate crime assault which killed Hartman. For over fifteen years, public employees sworn to act as agents for justice have kept the confession of Jason Wallace secret under the auspices of privilege, despite the fact that failure to reveal the information has contributed to the unlawful detainment of four citizens, and that disclosing the information is clearly allowed. 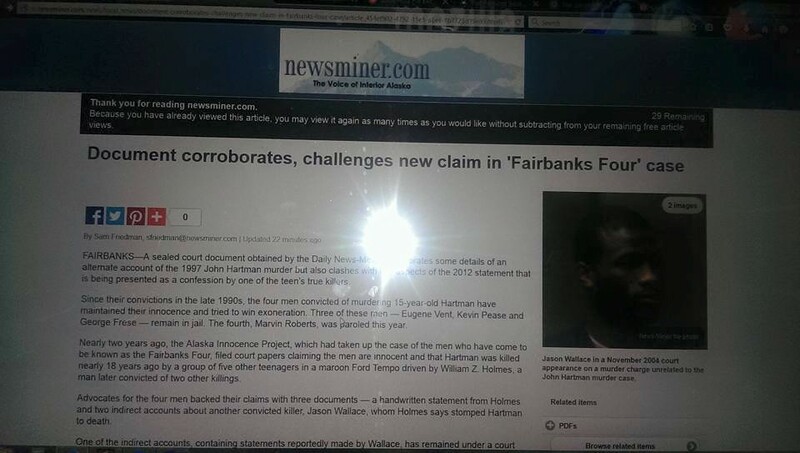 The article was live for a very short period of time before the link was removed and all traces of reporter Sam Friedman’s revelation in the Fairbanks Four case were rapidly erased from the Newsminer site. The printed paper in circulation throughout the city today shows no sign of the report. we can only speculate that the newspaper removed the article after experiencing backlash from some local or state player – and likely from the source of the information leak. Prior to the removal of the article, several members of the “Free the Fairbanks Four” Facebook page copied and preserved the text. We are opting to republish the article in its entirety, along with a series of images which confirm that it was indeed posted by the newspaper. It is supposed to be the job of the press to report newsworthy and credible stories without attention to political pressure or consideration for the reputations of the players. Certainly, the Newsminer showed no hesitation when running the first articles in this case which contained incredible inaccuracies, unchecked information, astounding bias, and fed the community frenzy which contributed to the hasty and wrongful convictions of George Frese, Kevin Pease, Eugene Vent, and Marvin Roberts. When the players are have more social capital the rules of reporting apparently swing as far in the other direction. According to their own article, the Newsminer has factual and credible information on the confession of Jason Wallace and has opted to rescind an article which fulfills the most important duty and responsibility of the free press – to report the news. It appears the press is not nearly as free as it ought to be here in the Golden Heart City. In a world where journalists are beheaded for speaking the truth and jailed for protecting their sources, the cowardice it takes to remove the article stands out all the more. FAIRBANKS—A sealed court document obtained by the Daily News-Miner corroborates some details of an alternate account of the 1997 John Hartman murder but also clashes with key aspects of the 2012 statement that is being presented as a confession by one of the teen’s true killers. Since their convictions in the late 1990s, the four men convicted of murdering 15-year-old Hartman have maintained their innocence and tried to win exoneration. Three of these men — Eugene Vent, Kevin Pease and George Frese — remain in jail. The fourth, Marvin Roberts, was paroled this year. Nearly two years ago, the Alaska Innocence Project, which had taken up the case of the men who have come to be known as the Fairbanks Four, filed court papers claiming the men are innocent and that Hartman was killed nearly 18 years ago by a group of five other teenagers in a maroon Ford Tempo driven by William Z. Holmes, a man later convicted of two other killings. 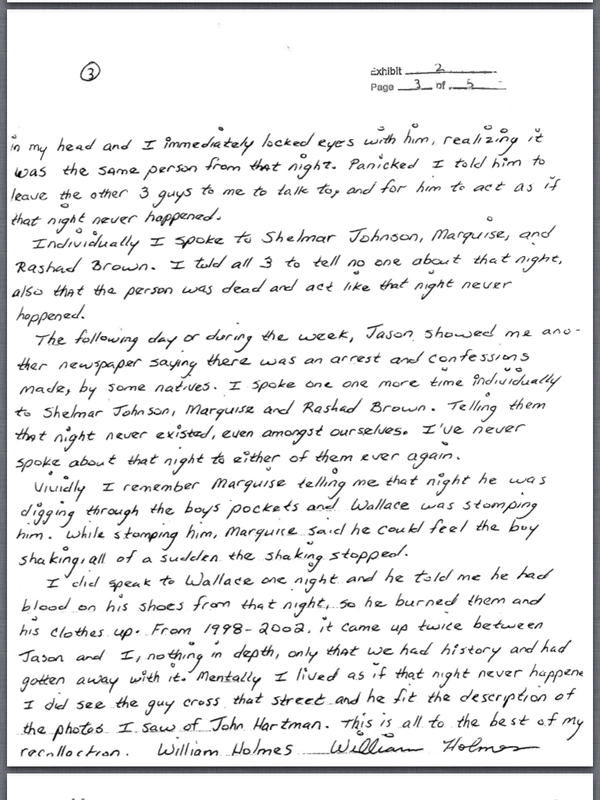 Advocates for the four men backed their claims with three documents — a handwritten statement from Holmes and two indirect accounts about another convicted killer, Jason Wallace, whom Holmes says stomped Hartman to death. One of the indirect accounts, containing statements reportedly made by Wallace, has remained under a court seal. It is awaiting a court determination on whether a statement Wallace made to a Public Defender Agency employee can be used as evidence. The News-Miner obtained a sealed court document that contains a summary of Wallace’s purported confession after an individual with lawful access to the document inadvertently provided it to the newspaper. Holmes and Wallace were Lathrop classmates who went into the cocaine-trafficking business. Holmes is serving a double life sentence and Wallace a 70-year sentence for murders committed in a failed 2002 takeover of a drug business. Wallace beat an Ester woman with a hammer while Holmes shot two men en route from Tacoma, Washington, to California, according to the cases against them. Holmes told a California prison chaplain in December 2011 that he was involved in the Hartman murder. He repeated the assertion in a sworn statement in August 2012 for the Innocence Project. Holmes wrote in his affidavit that he was driving around downtown Fairbanks on Oct. 10, 1997, with four others looking for an intoxicated Alaska Native to beat up, something he used to do for entertainment at the time. 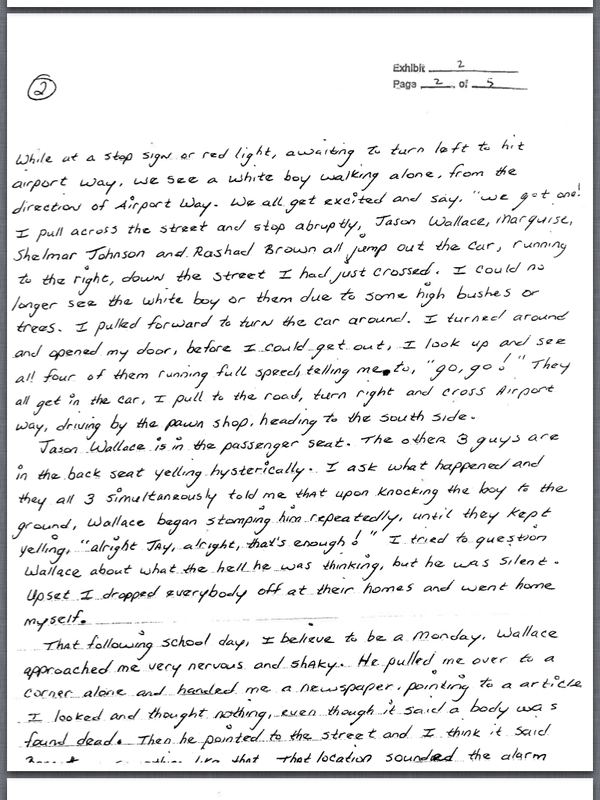 During their drive, they came across a “white boy” walking alone, he wrote. Holmes said Wallace and the three other young men in his car got out to beat up the boy. Holmes said he remained in the car and that he couldn’t see the beating because bushes blocked his view. The group later realized from newspaper accounts that the boy they had beaten was John Hartman and that he had died from his injuries. Wallace’s account shows some similarity to Holmes’ account but also has some key differences. Superior Court Judge Paul Lyle described Wallace’s narrative in a sealed November 2014 ruling related to the Alaska Innocence Project’s exoneration case. The ruling is under seal pending a court ruling on its status because it relates to a statement Wallace reportedly made to a Public Defender Agency employee, information that is supposed to remain confidential. Wallace’s statement reportedly originated from a visit he had from Thomas Bole, then an investigator for the Public Defender Agency, which was representing Wallace in the unrelated 2002 murder case. Lyle’s ruling says Bole went to Fairbanks Correctional Center to interview Wallace in January 2003 after Wallace told court-appointed attorney Geoffry Wildridge he had information about the Hartman case. Wallace reportedly told Bole that he — not Holmes — was driving the car. And he says it was Holmes and another of the people named by Holmes who beat Hartman. Wallace says he remained in the car while Hartman was assaulted. Wallace also reportedly mentions a total of three young men in the car, including himself, differing from the five mentioned by Holmes. “Wallace said that Holmes and [the third person] jumped out of the car while he waited in the car. He did not witness the assault, but, when they came back to the car Holmes and [the third person] had a couple of dollars,” Lyle wrote in his summary. “Wallace told Bole that he thought the petitioners found and killed Hartman because Hartman had been sexually assaulted and he apparently did not think Holmes or [the other person] would have done that,” Lyle wrote. Lyle clearly mentions, in a footnote, that he is not passing judgment on what Wallace is alleged to have said: “The statements of Wallace summarized in this paragraph are not considered for the truth of the matters asserted.” His note says they are included because they are relevant to the question of whether Wallace was seeking advice from his attorney. Wallace, in the judge’s summary, also references an incident that preceded the attack on Hartman, one not mentioned by Holmes. Deli — and, after a while, returned to their car and drove down Barnette Street, where they encountered Hartman, who was walking. Lyle’s summary of Wallace’s purported statement doesn’t mention what car they were in. Holmes makes no mention of the First Avenue assault in his five-page affidavit. He says the group of five — not three — left a girl’s apartment to go downtown, with Holmes driving. Holmes said the other four men jumped out of the car and chased two Alaska Natives but returned to the Ford Tempo when the men ran into an alley. He said there were 10 other grown men in the alley. There is no mention of an assault. The group, according to Holmes, then drove around downtown for about 20 minutes “without seeing anyone else to harass” and decided to return to the apartment where they had been earlier in the night. 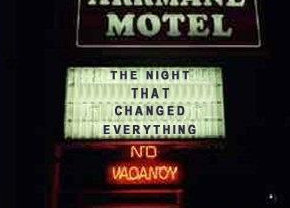 It was at that time that they encountered Hartman, he wrote. The victim of the First Avenue assault mentioned by Wallace is not identified in Lyle’s ruling, but an assault in front of the Eagle’s Hall on First Avenue figured prominently in the case against Frese, Vent, Pease and Roberts. The four were convicted of that assault in the same trials that led to their murder convictions. Wallace’s alleged statement about the Hartman murder came to the Alaska Innocence Project by a circuitous process. Bole, the Public Defender Agency investigator who had interviewed Wallace in 2003, later passed the information to another agency investigator, Richard Norgard, who had previously helped found the Alaska Innocence Project and who had been in contact with the organization about the Hartman case. The parties dispute exactly when the information changed hands between Bole and Norgard, which matters because it determines who breached what is supposed to be a confidential relationship between a client and his attorney. Lyle, in his November tentative ruling, found it was not necessary for him to determine who breached Wallace’s confidentiality; rather, he wrote that the issue to be decided was the legal remedy for Wallace and how to handle the desired use of the information by attorneys for Frese, Pease, Vent and Roberts. The Alaska Innocence Project, which is leading the exoneration effort, is seeking judicial permission to use Wallace’s alleged statements as part of its case. Lyle and, later the Alaska Court of Appeals have each ruled that the attorney-client privilege was breached and that the Innocence Project can use the statements. Wallace opposes the statement’s release and has taken the matter to the Alaska Supreme Court, which has yet to hear the case. Below are some images which confirm the origin of the text. HERE is a link to a PDF version of the article. 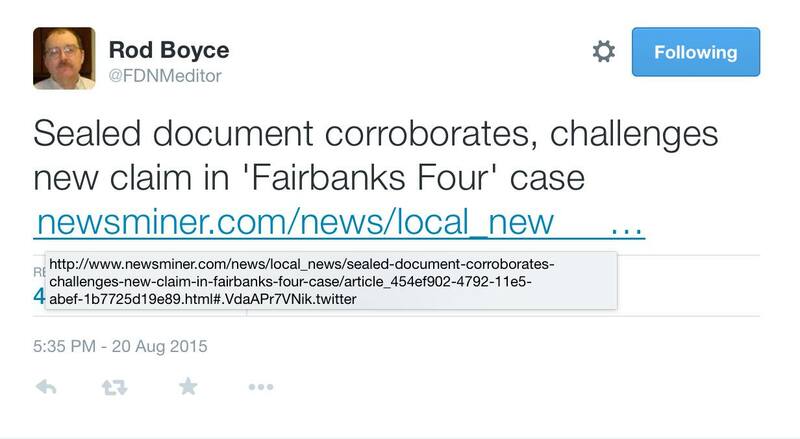 Newsminer editor Rod Boyce shares the article on his Twitter feed. 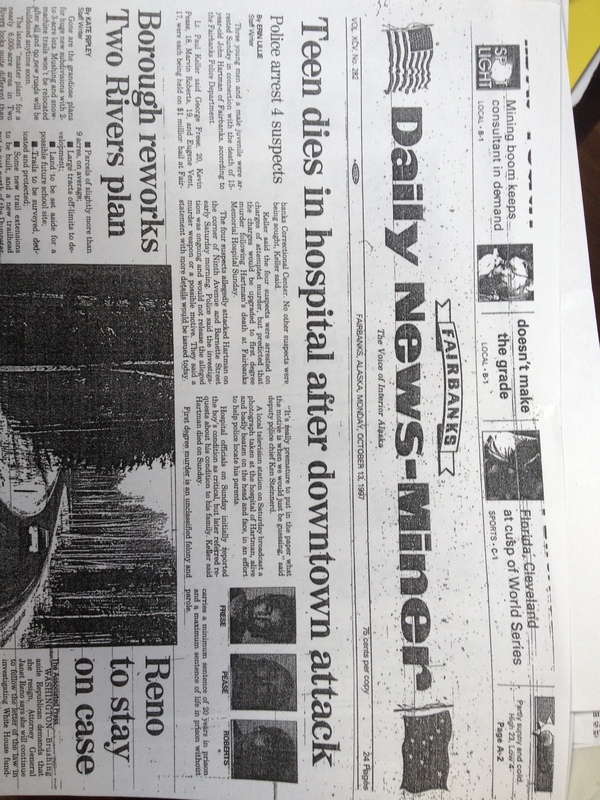 Article as seen on Newsminer.com prior to its removal. In late 1997 Lathrop student Scott Davison skipped school to smoke pot with friend Matt Ellsworth and fellow student Jason Wallace. While the three young men got high and talked, Wallace made a statement that would prove life-altering for Davison. According to Davison, Jason Wallace told them that he and his friends had beaten and killed John Hartman. He detailed a night of driving around looking for victims that culminated in the fatal beating for which four other young men had just been charged. Wallace ended the story with a threat. If Davison or Ellsworth ever repeated what he had just told them, he would kill them as well. At the time, Davison was only seventeen years old. He was a child. And he was now a child burdened with a terrible and violent secret and the very real possibility that unburdening himself of the secret would result in his death. To keep a secret is to carry a weight. It drags you down and it permeates the deepest recesses of the mind. It hardens the heart. What an awful curse to be placed on the shoulders of a child. Davison, understandably, said nothing to anyone. Years passed. If there was ever any doubt in his mind that Wallace was capable of making good on his threat, that doubt would have been entirely destroyed when just five years after Davison heard Wallace confess his first murder, Wallace killed again. 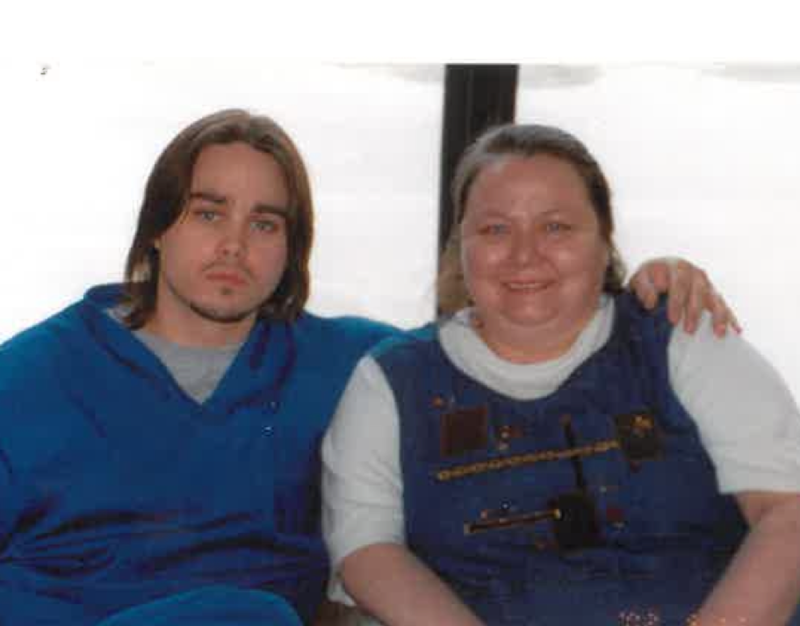 On Christmas Eve of 2002 Jason Wallace beat a young woman to death with a hammer, crossed town to stab another man repeatedly with a screwdriver, and then returned to the woman’s apartment to set her lifeless body on fire. Clearly, Wallace was not only capable of killing, he was capable of inflicting unthinkably depraved torture and killing in cold blood. He was capable of killing an unarmed woman on Christmas Eve. He carried within him a darkness beyond imagination. So, understandably, Scott Davison continued to hold his secret. Yet, a secret of that magnitude is a heavy burden. It is difficult to imagine the internal tug-of-war that any human being holding that information would endure. On one hand, innocent men are in prison. On the other hand, the system in place put them there and could not be trusted to allow the information to free them. On one hand, Wallace was locked up and couldn’t just show up at the door. On the other hand, Davison himself was in and out of jail at that time. On one hand, his life could be destroyed or taken if he revealed his truth. On the other hand, four other men’s lives had been destroyed. Hartman’s life had been taken. Davison must have weighed these things over, and over, and over. Like a stone tumbled for years until finally the rough edges are worn away and the stone is smooth. And after years of that internal dialogue, Davison made a choice. He had nothing to gain. Absolutely nothing to gain. Nothing, that is, besides becoming a man who was given a choice and made the right one. With his life and dignity and reputation at risk, Davison walked into the Innocence Project office and revealed the secret he had been so unfairly lain in his life’s path on a snowy October afternoon in 1997. There is a reason for everything. Davison was not the victim of happenstance. To be the bearer of a truth so heavy was a task he was fated for, because Davison did something with it that few are capable of. He risked his life, he signed up for humiliation, risked retaliation, reputation – he laid all he had to offer down in service of a higher truth. Much of the State of Alaska’s filing made in response to the Alaska Innocence Project’s aimed at demonstrating the innocence of the Fairbanks Four is focused on the task of discrediting, humiliating, and slandering Scott Davison. Although prosecutor Adrienne Bachman waxes disjointedly and frequently about hearsay throughout the twenty-three page document, claiming that the Holmes confession and Davison’s statements are both hearsay and therefore have no place in a court of law, the remainder of the filing appears to consist nearly entirely of actual hearsay generated by Bachman herself. She makes one claim after another about the character of Scott Davison, yet the filing contains no documentation to support that her claims are factual. Bachman berates and belittles Davison in every imaginable way. She calls him an informant in one breath, and with the next says he did not follow through with a request to be an informant. She speculates about the relationships Davison had, claiming he was “charged often and convicted occasionally” of domestic violence. Which, of course, means what it says – despite frequently being accused of domestic violence inside a relationship, he was seldom found to be guilty of the charges. Not that the nature of his relationship drama has a thing at all to do with his credibility. Bachman asserts in her filing that because Scott Davison has nothing to gain by coming forward, and that in the past when he had legal problems he could have attempted to leverage this information to ask for leniency in his own sentencing and did not, that he should not be believed. Read that one twice. She says there is nothing in this for Scott Davison personally, and somehow that makes him less credible. Umm…okay, Adrienne. In all reality, the fact that he has nothing to gain and so much to lose bolsters the credibility of his statement. She further attacks his credibility because he did not come forward in 1997 when Wallace first confessed to him. Yet, Davison was a teenage boy when he heard the confession of Wallace. Wallace had literally just gotten away with murder, and threatened to kill Davison should he come forward. It is unreasonable for anyone to think that a child sworn to secrecy under threat of death would call the police to tell them the secret. A secret he had heard while skipping school to get high. It is reasonable to expect an adult to make that judgment – to come forward despite the risks. And when Davison became an adult he used the judgment of one and came forward. But in 1997 he responded the way any thoughtful person would expect a child to respond. With fear. He was scared, as anyone would be. As a young man Scott Davison clearly took a troubled path. It was that troubled path that crossed with Wallace’s. If not for the poor life choices Davison was making in the late 90’s, he would have never encountered Wallace. Although Bachman attacks his credibility based on his past criminal activities, it is only logical that anyone who had credible information on Wallace would be an associate. And most of Wallace’s associates would have had criminal tendencies. Brids of a feather, as they say. Davison was a drug user and committed a series of crimes, primarily domestic violence and violations of the original conditions of release which all stemmed from an incident in 1998 when Davison apparently robbed someone and injured them in the course of the robbery. She describes this in such a way as to lead a reader to believe that Scott Davison ran up to an old woman, slashed her face, and ran off with her purse. Although her characterization of the events is dramatic, it is unsupported and irrelevant. Scott Davison has clearly made mistakes in his life. He has made choices I cannot and will not defend, and he has made choices which are not admirable. Most human beings have made choices that are not defensible, and that we are ashamed of. Most of us would be devastated to read our regrets, shame, and sins on the front page of the paper. Scott Davison may have made some bad choices, but he made one decision that I find heroic. With nothing to gain and everything to lose, he opted to tell the truth and do the right thing for four strangers. For fellow human beings that he did not know. He laid his life on the line for men he never knew. And that, my friends, is one of the most courageous things I have seen a person do during my time on Earth. When the investigators for the state contacted Davison he stuck with his story. They attack his credibility on minor details – in one version of events he claimed they smoked pot inside a car, in another version outside, etc. 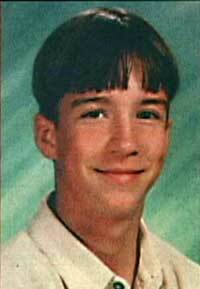 But on this point he did not waiver: Jason Wallace had confessed in detail to murdering John Hartman in 1997. When the state was unable to attack the factual merit of Davison’s story, they attempted to attack his will. They attempted to humiliate and discredit him as a human being when they realized that he could not be discredited as a witness. Scott Davison, wherever you are, thank you. From the bottom of our hearts. Matt Ellsworth, wherever you are, please, DO THE RIGHT THING. That secret was bestowed upon two men. Two men have turned this over and over in their minds and made very different decisions. Davison’s is to speak, Ellsworth’s is to remain silent. 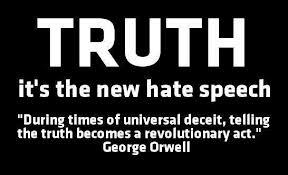 We have said before and will say again the enemy of the truth is not a lie, it is silence. It is time to speak up. Four innocent men are in prison. Many murder victims followed Hartman and their lives could have been saved. Ask yourself, are you the kind of man who in the face of oppression with lives on the line speaks or remains silent? What would you wish from your fellow man if you were the the victim of injustice? It is understandable to be afraid then, and now. But how does a secret keep you safe when murderers know you are keeping it? The time for secrets is over. Scott Davison should not have to stand alone. You should be standing behind him. And if you do, we will stand with you. Imagine hearing a confession of murder as a kid. Imagine carrying that secret for years. Imagine mustering the courage to speak out. And imagine, for a moment, what it must feel like to be so personally and obscenely attacked as retaliation for doing the right thing. Whatever his past misdeeds, Scott Davison did what the State of Alaska will not and more: he accepted the risk of humiliation and even death to protect the concept of justice. Scott, thank you. We are so very sorry for the way you are being treated, and admire your decision to come forward. No matter what contents of your past the state chooses to parade around, your courage in this case has revealed the content of your heart to be good. Keep on keeping on! 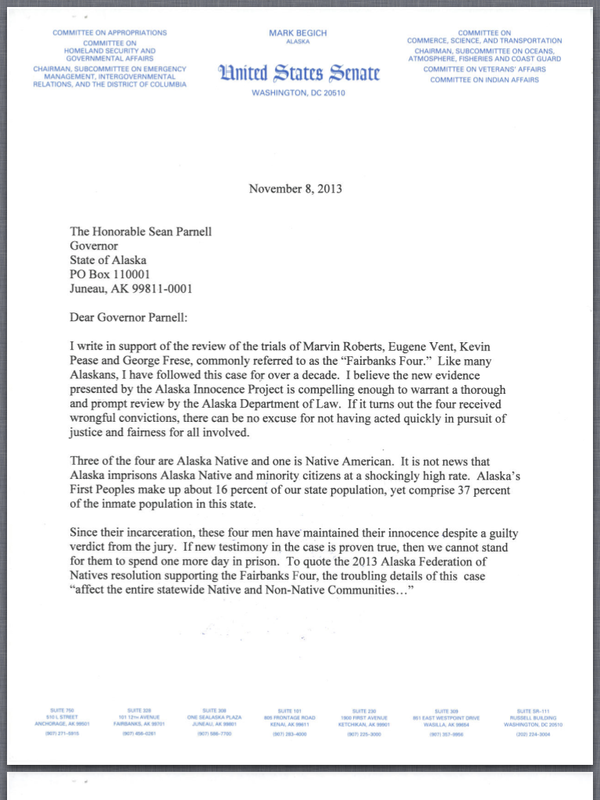 Following in the footsteps of many ordinary citizens, local leaders, and more recently Alaska Senator Lisa Murkowski, Senator Mark Begich released a letter to Alaska Governor Parnell asking for swift justice in the case of the Fairbanks Four. We applaud Senator Begich for advocating for justice. Leaders take a stand when the good of their people is at stake, regardless of the political cost or benefit. Both Begich and Murkowski have taken a risk and demonstrated that they have what it takes to lead. We hope the Governor is getting the message from above and below: this case is a test of the transparency, ethic, functionality, and intent of the justice system under Parnell. So far, Parnell’s administration and the Attorney General are failing this test. 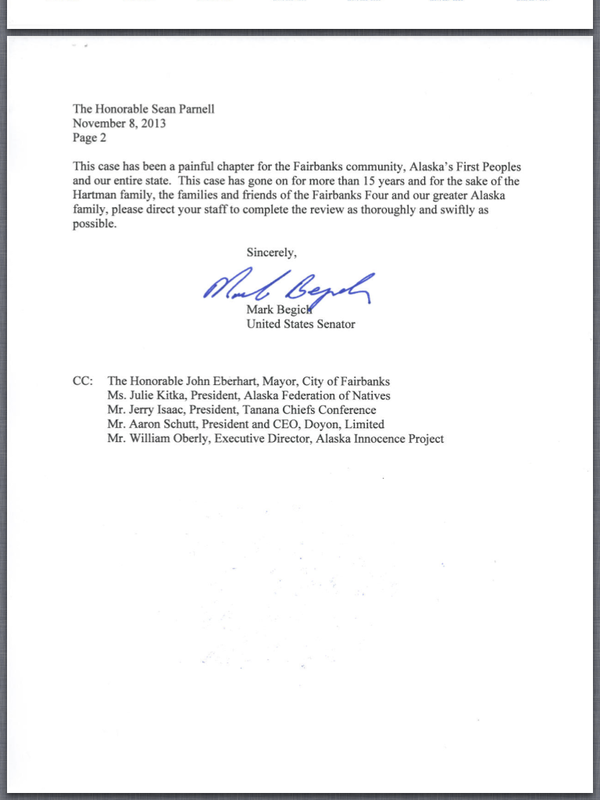 When state prosecutor Adrienne Bachman announced that the state had just begun its investigation 37 days into their allotted 45 days, the prosecutor’s dismissive remarks were followed in short order by this letter from Senator Murkowski. Following the state’s request for an extension until May 15, 2014, the letter below from Senator Begich was released. It speaks for itself. BE encouraged by these letters. This fight has been long and in some ways has only just begun. There remain forces of darkness inside the justice system, but the truth will soon prevail and clear a path so that others will not experience the same injustice. The light is coming. For those of you that have read this blog from the beginning, consider for a moment that most of the events we have discussed here represent mere hours of real-time. If this blog took place in real-time, the victim in the crime would still be on life support in ICU, not yet identified. The evening news would come on with a picture of his badly beaten face, identifying him only as John Doe, and pleading with residents of Fairbanks to help identify the boy. Eugene would be in Fairbanks Youth Facility, just beginning to sober up, no doubt terrified and confused from many hours of interrogation with the Reid Method. He would be spending the first of the more than 5,300 nights in jail to come. George would still be in interrogation. Later that night he would go home, tell his girlfriend’s brother about the interrogation, how terrified he had been, that he felt like they had made him agree to a crazy story, that he was afraid. Then he would lay down and let his small daughter fall asleep beside him for the last time. Marvin would be at home with his mother, bewildered and shaken by his interview with police but confident that the ordeal was over, and with no idea that the police were coming to arrest him in mere hours. Kevin would be at home with his mother and girlfriend, watching that broadcast, not yet aware that the police were already using his name in their theories and as a device in interrogations of others. And in the press room of the local Fairbanks Daily Newsminer, the first articles about this case were being checked for typos. Headlines were being written. And as those first words went to press, the saga of the Fairbanks Four began in earnest, as did the decades long role of the media in this case. Our next posts will be copies of the original newspaper articles in the case. 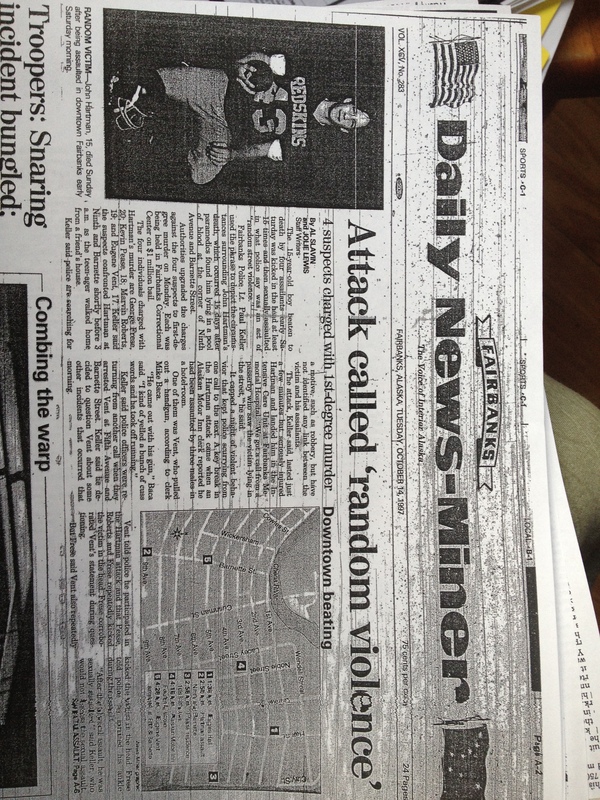 The first newspaper article on the case appeared on Monday, October 13th. The front-page article was titled “Teen dies in hospital after downtown attack” and contained little information. It said that four men and one juvenile were being held on $1 million bail, and that the motive for the attack was unknown. They promised details would follow the next day. The next day, on October 14th, the case was front page news again, this time with details that ignited a deep and widespread rage throughout the small Alaskan city. Most of the details would prove to be fiction in the days and weeks to follow, but the damage was done. These details would be the ones that Fairbanks residents remembered about the case forever – these details would inspire randomized attacks on Native Alaskans with crowbars downtown in the days to come. These details would create a divide that may never be healed. 1. The victim was “kicked in the head at least 15 times and then sexually assaulted.” In reality, there was no confirmation of any kind that there had been a sexual assault. The manner of death remained unknown, and the number of blows suffered remained unknown. The victim had been found with oversized pants near his knees(belonging to Chris Stone, the last person to see him alive), creating speculation among hospital staff that he may have been sexually assaulted. Ultimately the medical examiner would state there was not evidence of a sexual assault. Other experts to review the report would agree that there had been no sexual assault. 2. “Paramedics found him lying in a pool of blood.” Although this is likely true, and corroborated by the statement of the college student Calvin Moses who found the victim, no photographs were taken of the scene. Police would later claim that there was almost no blood, or an “insignificant” amount of blood, and offer that as the explanation as to why there was no DNA evidence of any kind to tie the accused to the crime. 3. “The suspects confronted the victim shortly before 3 am as the teenager walked home from a friend’s house.” No one had described any circumstances surrounding the attack – there was no indication of any kind of confrontation. The victim was walking with a friend, and was not walking home from a friend’s house. More importantly, the assault took much earlier, near 1:30 am, and at a time the men had alibis. Read about that HERE. 4. 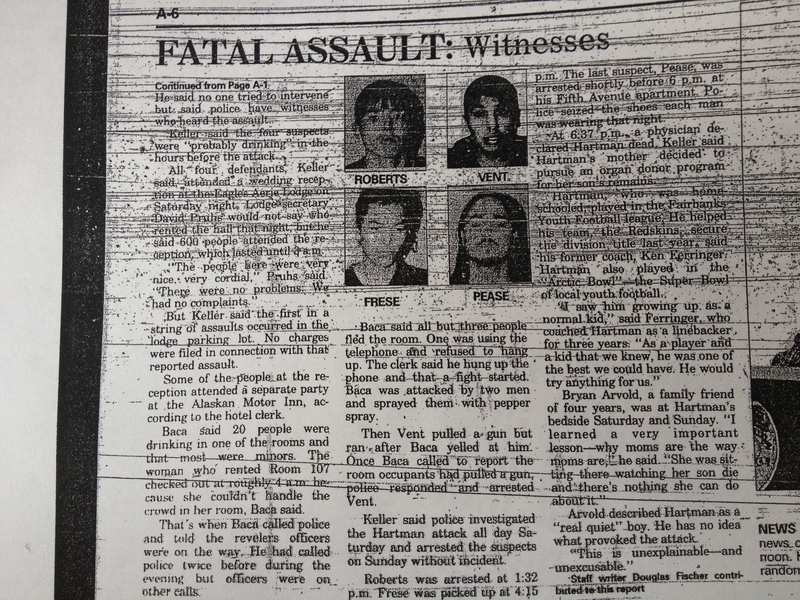 “A key break in the Hartman investigation came when a hotel clerk reported he had been assaulted by three males in a hotel room.” Although the hotel clerk Mike Baca rapidly confessed to having fabricated the story of the gun-weilding attack, even in his original fictitious report he did not describe being assaulted by three males in a hotel room. 5. “One of them was Vent, who pulled out a handgun.” Eugene Vent did not have any altercation with the hotel clerk. No one pulled a gun on the hotel clerk. The hotel clerk admitted that he made up the story in an effort to get police to respond to a loud and out of control teenage party at his hotel. Security cameras confirmed there was no assault, and no gun. Read more about that HERE and directly from Eugene about that night HERE. 6. “Vent told police he participated in the Hartman assault…..” Read about Eugene’s interrogation and read the transcript of the interrogation HERE. 7. “Frese corroborated Vent’s statement…” Read about George’s interrogation HERE. Hear about that night from George directly HERE. 8. “No one tried to intervene but police have witnesses who heard the assault.” The second title of the story was “FATA:L ASSAULT: Witnesses.” No witnesses had come forward, and witnesses (plural) never did. One ultimately would, but her time-specific testimony would be upending to the police timeframe and theory. Read about her HERE. 9. The four suspects were “probably drinking.” Police knew that Eugene and George had been extremely intoxicated during interrogation, and also knew that Marvin had been sober the night in question. The insinuation that they were “probably drinking” insinuates that they were together, drinking together, and indicates intoxication as a motive even though the police know it was not a factor that night for all four men. It also reinforces sterotype. 10. “All four defendants…attended a wedding reception at the Eagle’s Lodge.” In reality, only Marvin attended the reception. George was in the parking area at one point, Kevin was in a car that stopped at the reception, and Eugene walked through the reception briefly looking for a friend. The four did not attend the reception together, and three of the four did not truly attend at all. For more information, read their timelines. 11. “The first in a string of assaults occurred in the lodge parking lot.” No assault occurred at the lodge or in the lodge parking lot. Frank Dayton walked to the parking lot of the busy lodge after he was assaulted to get help. Read about that HERE. That said, there was a troubling amount of violence that night, with a car and suspects that did not match the description of the four accused. Read about them HERE. 12. “Some of the people at the reception attended a separate party at the Alaska Motor Inn.” This information is attributed to the hotel clerk, who would not have known if the hotel room party and reception were connected. They were not connected events. One was a wedding reception for a respected and responsible family, the other was simply a teenager’s party. 13. “20 people were drinking in one of the rooms.” There was never any indication that 20 people were present at Alaskan Motor Inn. 14. The article went on to identify Hartman as home schooled (in reality, he was not enrolled in school) and as a football player (he had not played on any sports team for more than a year). The picture used was out of date, exaggerating the contrast between the accused and the victim. Ultimately, the article was little more than a fictional yet sensational story that would be repeated over and over in the community of Fairbanks until it was universally accepted as true. It was easy to accept that it was true, even though nearly all of it was embellished, because the story woven from half-truths and lies took advantage of racial stereotypes hundreds of years older than any of the people writing or reading it. Four drunk Native men killed a white all-American boy and raped him for no reason, he just happened to be in the way on a night when they were on a spree of random violence. Savage. Attacking children, white children, for no reason. Four on one. Merciless. The first newspaper articles on this case printed lies. Lies told by a bored hotel clerk named Mike Baca and police Lt. Keller who was desperate to solve a crime and save face. The sensational plot line was never plausible, accurate, or backed up by facts. Yet, this story was accepted because it had already been written into this town. Into this country. In newspapers, hearts, minds, souls, history, the future. It struck a chord in a population with a bias, and in shock over a brutal crime, that bias blinded them. The Fairbanks Four were tried and convicted in the newspaper October 14, 1997. They were not innocent until proven guilty. They would be convicted with lies and sensationalism a hundred times in the press before they were convicted with lies in a courtroom that had made its mind up long ago. In a few short months, newspaper articles would begin to unearth inconsistencies in the case. Ten years after the murder the first ray of hope – the largest and most serious effort to expose the injustice the Fairbanks Four had suffered would be a series of articles, covering the front page of the Fairbanks Daily Newsminer for weeks in a row, just as the case had in those early days. But this series would focus on the many indications that the Fairbanks Four had been wrongfully convicted. Perhaps they will be exonerated in the press a hundred times before they are exonerated in a courtroom, just as they were convicted first in the press. Either way, the local press is one of the most compelling characters in this story, one that plays a fascinating and always-changing role – a character we introduce in this post and will write about many times before this story is over. Although the story of the Fairbanks Four has roots in history, both recent and distant, the story we are attempting to tell begins in the early morning hours of October 11, 1997 with the brutal murder of a teenaged boy on a on a freezing cold Alaska night. 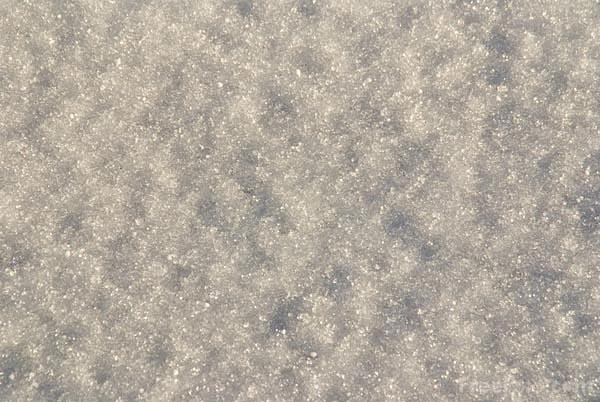 He was found alone, draped over a snow covered curb, bleeding, barely breathing, life leaving him. His pants were around his knees. He was transported to Fairbanks Memorial Hospital where he would die the next day. He remained unconscious and had no identification. It was many hours before anyone knew his name, but eventually the people of Fairbanks, Alaska would remember that name forever. John. John Hartman. It is important to say his name singularly, alone. Partly because it is never wise to speak the name of the dead lightly, partly because it is wise to remember that there is power in a name spoken aloud. It reaches the living, and hurts them again. Touches them where they were hurt once, on the wound that never heals. It echos into the air and the wind takes it through leaves, past branches, to heaven, to the other side. The dead hear us say their name and we should never forget that. He was just a boy, caught in the season of change, where you play at being a man because you almost are. On October 11, 1997 he walked toward home one last time and something terrible happened. Feet and fists and hatred of unknown origins landed on his body over and over and over until he was very still, cast away and left for dead on the streets of downtown Fairbanks. This is what we know of his last night on Earth, gathered primarily from newspaper accounts, police reports, trial transcripts, and the work of reporter Brian O’Donoghue alongside his UAF journalism students. Their detailed account of John Hartman’s last night can and should be read here. We have distilled it to the very basics below. John spent most of the evening with his two friends, EJ Stevens and Chris Stone, at the Rainbow Inn Motel. It is a place not unlike many across the country, and strikingly similar to a motel across town called the Alaska Motor Inn that also became a crucial location in the murder investigation. In 1997, both motels had dull gray exteriors, peeling paint, and bad reputations. The rainbow that dominated the sign at the Rainbow Inn made a mockery of the slum that waited inside. In 1997 it was known as a good place to score drugs, and a bad but cheap place to live. The floors were tilted and the carpet stank. John’s friend EJ was there babysitting a toddler that night at the Rainbow Inn. John and Chris went there to hang out. It has been alleged that they took LSD, perhaps meth, and antidepressants, and that John had a seizure there. At the Rainbow Inn, and throughout the day, John was wearing very distinctive camouflage pants. This orphan fact has troubled many who followed the case closely enough to know that a short time after leaving the Rainbow Inn John would be found dying with his friend Chris’ corduroy pants around his knees, the camouflage pants missing. From the time that EJ, Chris, and John departed the Rainbow Inn, a countdown to his murder begins. 1:12am When the parent of the toddler returned home, he was not happy to see that EJ had invited John and Chris over. He paid for the boys to take a cab to EJ’s house across town. 1:20am (approximately). EJ’s mother watched the boys get out of the cab. Her son came inside and, she says, John Hartman and Chris Stone walked off together. Chris Stone claims the opposite, that they headed in separate directions, with John Hartman walking down the road toward the site of his murder, and Chris heading the opposite way. 1:30am John Hartman was beaten and viciously murdered at the corner of 9th Avenue and Barnette Street. 1:45am Chris Stone ran into Foodland, a grocery store a few blocks from the murder site, panicked, saying something about his friend being hurt. Around this time Chris left a terrified-sounding message for family friend Barbara Higgins. She tried for weeks to persuade police to get a copy of the message. They were not interested, and eventually it was accidentally erased. 2:50am A car full of people leaving a downtown wedding reception (a location that would become central to the investigation) found John Hartman barely clinging to life on the curb. He was not wearing his camouflage pants, but Chris Stone’s blue corduroy pants, and they are down around his knees. The motorists called 911 and John Hartman was transported to Fairbanks Memorial Hospital. 6:30am After many hours of care in the ICU, and hours spent searching for his family who thankfully were located in time to wait at his deathbed, John Hartman was declared dead. At that moment John Hartman officially became a murder victim. He left this world for the next. The lives of his loved ones changed forever. The lives of many, many people changed forever. 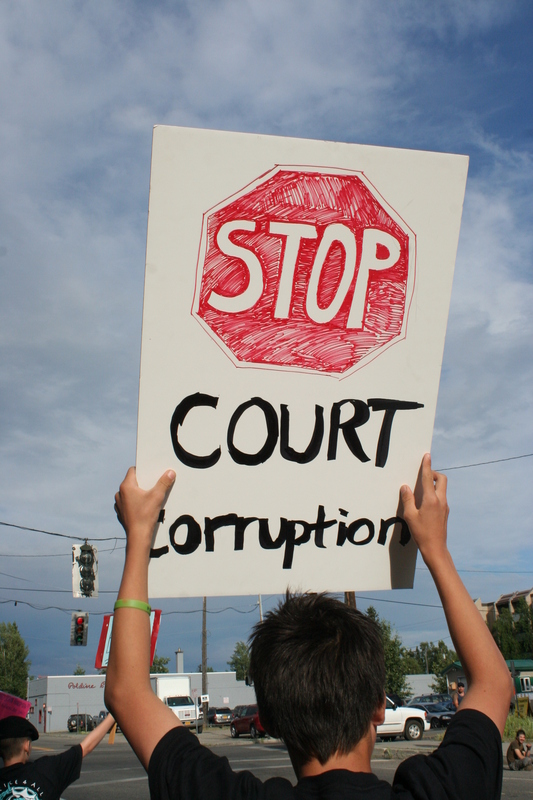 There will be many future posts in which will discuss the flaws of the investigation, the way that racism appears to have figured into the arrests and convictions of the Fairbanks Four, what we see as corruption, and much more. But for now, we want to let the very sad story of what happened to this young man stand separately, as it should. Keep in mind that we are not reporters, but activists. There is ample, incredibly detailed reporting on this case. Please visit Extreme Alaska to read a detailed account of John Hartman’s last day. 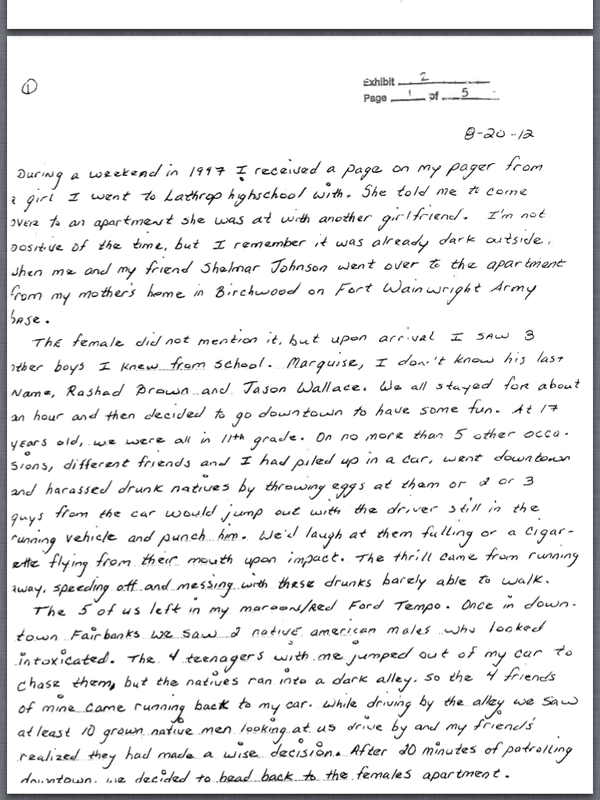 You can also read details of Chris Stone’s movements, his testimony, the story of how he had suffered a similar and severe beating a few weeks earlier, and much, much more information than we could provide here in the Newsminer series about the case published in 2007.